Areas to consider that will enhance and extend classroom teacher learning in and beyond the PD experience. DEFINITION: What does it mean to Extend an arts integration PD experience? The teaching artist can give valuable support and provide resources that are beyond the scope of the face-to-face interactions in a PD experience. Such support may enhance the PD experience by giving classroom teachers something to take away and use in their classrooms. Support may also extend the arts integrated learning into new content or subsequent lessons over the long term. The teaching artist may also enable the classroom teachers to move beyond the strategies that were the topic of the PD experience, inspiring them to explore further explore the possibilities of integrating the arts in their classrooms. related to the many topics below. PURPOSE: Why is Extend important to an arts integration PD experience? Beyond the initial PD experience, classroom teachers may need encouragement and assistance to get the strategies up and running in their classrooms. Research into successful PD implementation suggests that follow-up by teaching artists after a PD experience is essential to classroom teachers’ ability to change their teaching (See the table below). While coaching, the most time-intensive support, holds the greatest potential to transform teacher practice, other types of support do make it more likely that a teacher will try out the new strategies and persist in applying them to lessons over time. Transfer to Practice: regularly implementing in the classroom. IN PRACTICE: How might Extend be applied to an arts integration PD experience? Teaching artists can provide a number of valuable resources for classroom teachers’ use in class. Posters, and interactive charts of information essential to implementation can give teachers the “scaffolding” they need to begin, persevere, and succeed with arts-integrated strategies in their classroom. For example, as a part of a music residency, a teaching artist provides each classroom with a laminated chart allowing the class to continue to apply their newfound skill composing rhythms using boxes representing beats. With a dry-erasable chart on hand, the classroom teachers can employ the strategy on their own following the residency. A teaching artist might offer classroom teachers an implementation kit including student manipulatives, a CD of music, and a set of facilitation flashcards for the classroom teacher (see Resources). A teaching artist may wish to provide all participating teachers with a workshop packet that both summarizes the workshop experience (including Establishing Purpose and Learning Targets) as well as provide one-page strategy “cheat sheets” to remind classroom teachers of the sequence of steps for facilitation, sample lesson plans, planning templates, recommended resources and further reading (see Resources). Video can be a powerful tool for giving classroom teachers a glimpse of teaching artists in action in a real classroom, without the need for the teaching artist and the students to be present. Classroom teachers often express a desire to see a strategy demonstrated with “real kids,” and PD experiences are rarely able to include live students. By recording themselves implementing arts strategies with students, teaching artists can demonstrate the finer points of facilitation in an authentic classroom context. A teaching artist can encourage implementation of arts integrated strategies by asking teachers to build newly learned strategies into upcoming lessons or units. One example of this approach is the portfolio embedded in many workshop courses for professional credit. By holding teachers accountable for planning, teaching, assessing, reflecting on and documenting the arts integrated strategies they implement as a part of a PD course, the portfolio assignment creates a clear expectation that the new skills will be used with students and reflected upon by the teachers. Ideally, this collection of plans, student work, and reflection can serve as a guide for many future forays into arts integrated teaching by that teacher along with colleagues. The teaching artist may offer or be invited to lead a lesson within the classroom, with a structured reflection scheduled afterward for the purpose of enhancing and extending the teacher’s arts integrated practice. Similar to coaching, these visits are ideally paired with a meeting between the teaching artist and classroom teacher both before and after the lessons. Demonstration lessons may be a good choice for follow-up support if the classroom teacher does not demonstrate a high comfort level or willingness to attempt the arts-integrated strategies on their own following a PD experience. Perhaps the most powerful—and time-intensive—implementation support is coaching. In this model, teaching artists (or qualified school personnel) directly observe a classroom teacher in the act of implementing arts integrated strategies. The coach may co-plan a lesson with the teacher, observe the lesson, and reflect with the teacher afterward in order to monitor the effectiveness of the strategy and to continuously improve the quality of the arts integrated lessons. Video can also serve as a means of coaching. A classroom teacher who is uncomfortable with being observed may experience anxiety or “freeze” when a coach is in the classroom. By taking video of the lesson, the teacher can give the instructional coach a chance to review the full lesson and give useful feedback, in a convenient and stress-free manner. A hybrid version of the coaching and demonstration teaching approach is planning, teaching, and reflecting on lessons together. This partnership is sometimes referred to as a “collaborative residency.” In this model, the teaching artist and the classroom teacher take joint responsibility for planning, implementing, and assessing an arts-integrated unit of instruction. 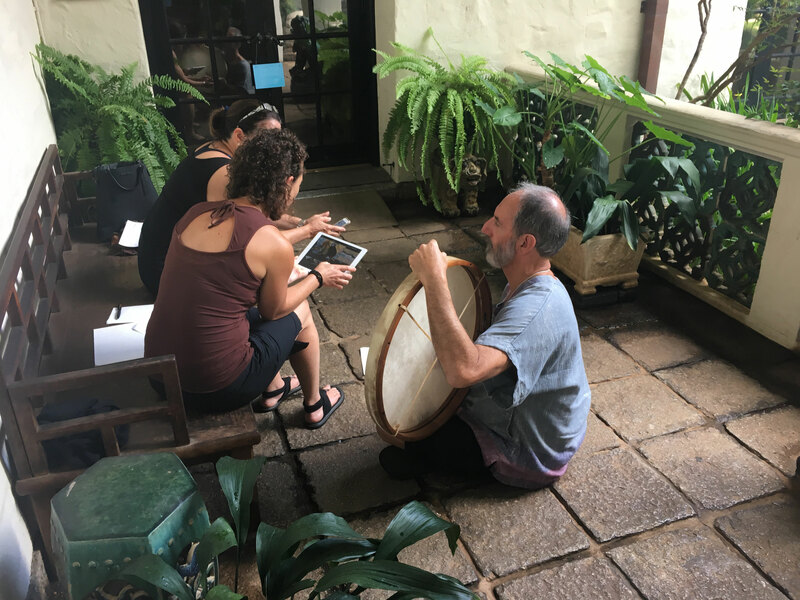 In the collaborative residency model, the teaching artist and classroom teacher plan their unit during an intensive PD experience, under the guidance of an arts integration coach. Often, the teaching artist will take the lead at the beginning of the unit, then the classroom teacher will gradually transition into full leadership of the lessons by the end of the unit. The collaboration required over the course of this type of PD follow-up represents joint accountability for implementing the arts integrated strategies, and tends to build creative energy around the unit as the learning unfolds. In schools using the teacher-driven action research model of continuous improvement, teachers can use arts integration strategies as their topic of reflective inquiry. By posing questions about their pedagogy (e.g. “Does adding elements of drama to a literature study unit enhance students’ appreciation of a character’s point of view?”), then designing a change in approach that tests their hypothesis, teachers can apply the strategies learned in a PD experience to deliberately gauge their impact on instruction. In schools with collaborative, “embedded” professional development structures such as Professional Learning Communities (PLCs), teachers meet together regularly to evaluate the impact of their instruction, and adapt and adjust their teaching to better meet the needs of their students. Following an arts integration PD experience, teachers involved in PLCs can use their team time to develop and refine their arts integrated lessons, and gauge the effect these strategies have on student learning. Such collaborative work can be further enriched by the presence of an instructional or curriculum coach familiar with arts integrated teaching. Many classroom teachers take advantage of online resources and social media to create personal learning networks (PLNs) specifically targeted to their teaching interests. Email lists, Twitter conversations, Pinterest, Facebook pages and blogs are all 21st century means of creating forums where like-minded educators can confer and find support in their efforts to put new strategies to use. The Kennedy Center hosts the ArtsEdge website, full of resources for “learning in, through and about the arts.” Sites like this can be valuable to classroom teachers seeking arts integration lesson ideas, specific to an art form or content area. Teaching artists might make available a Wiki page to share resources and these could include a “notifications” function, to automatically notify all subscribers when new information is added.